I was up super early (for me) this morning and could not resist the lure of the garden. I spent the last two days outside, weeding, planting, planning, pruning and harvesting. And, weeks/months before that planning my fall garden. Central Texas finally cooled down enough, relatively, to spend some quality time with baby plants. I’ve done all that I think I will do this fall and start my planning for spring now. This morning, instead of digging in the dirt, I took my camera on a little walk about. Warning, this post is just a bit photo heavy. Proof of my early morning. 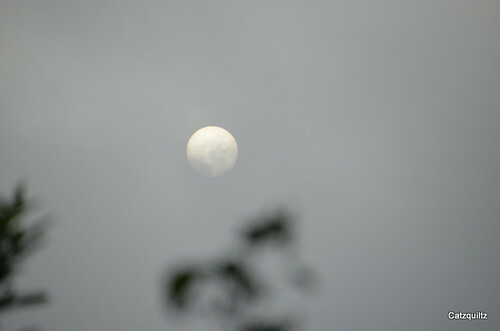 That is the sun doing it best impression of the moon behind the clouds. “Sun looks like the moon. Yeah! Yeah.” (sung to the tune of Aerosmith’s Dude Looks Like a Lady) HA! Now the song is stuck in your head too! Lets start with the showy ladies, strutting themselves in the new flower bed. 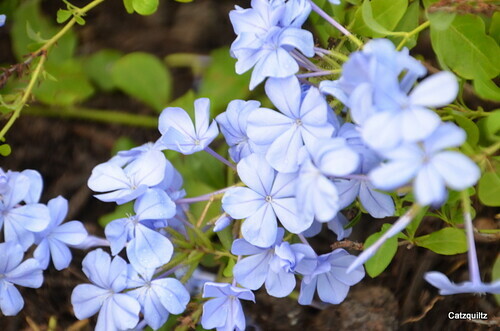 New Plumbago in the violet corner of the bed, hopefully not crowding the Butterfly Bush too much. I splurged on the big plant because it was blooming so beautifully. My Esperanza, a wedding gift from my Aunt Peggy, just can’t stop blooming. 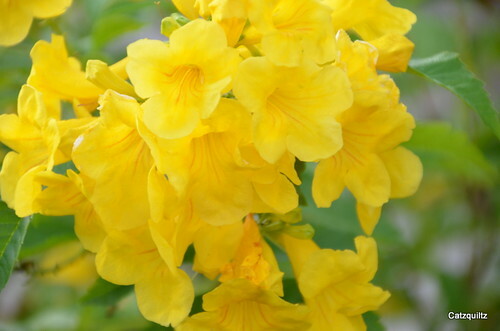 They put out huge clusters of yellow and when the petals drop, they create pools of gold all around the plants. The ground is as pretty as the plants. 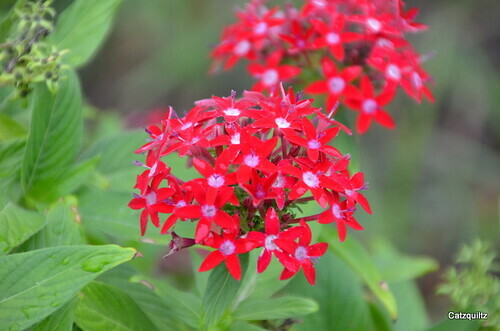 The Pentas, another wedding gift from Julie & Glen, has easily doubled in size since June. I think spring will bring some white and pink Pentas to keep this one company. Have to see how the new stuff around it fills in first. 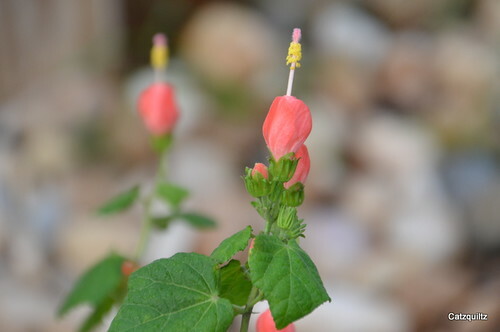 Pam’s Pink Turk’s Cap. This plant was a little sad looking at the nursery but, I just could not resist. I’ve never seen a pink version before. I got a few red ones as well. I’m hoping the red and pink spread around each other. Have to give those Humming Birds some variety to their diet. Not flowers but still colorful enough to give them a run for their money. 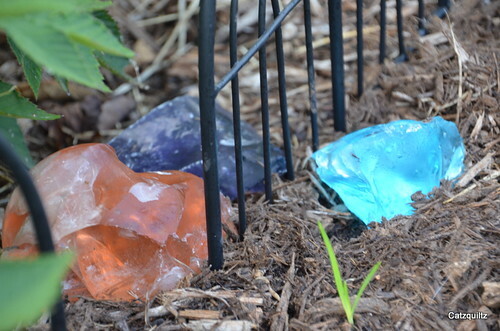 I have a few piles of bright glass chunks sprinkled here and there. I love these pops of color and wish I’d invested in a few more giant chunks. 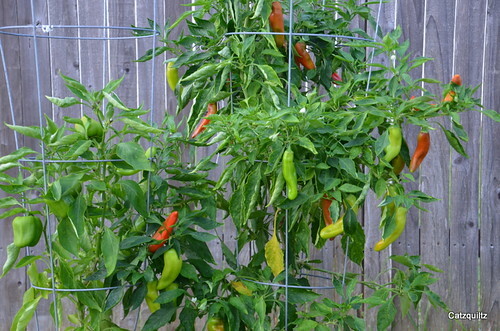 Over in the Veggie beds, the peppers are plotting about taking over the world. The Cubanellas show no signs of slowing down. The bell peppers are getting bigger. 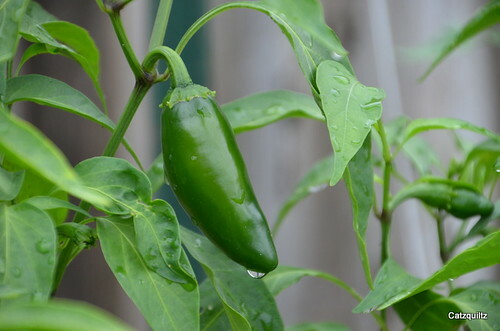 And, the jalapenos are just as hot as ever. I already made a batch of pickled peppers (yum) so, I think the next batch will go into the freezer. 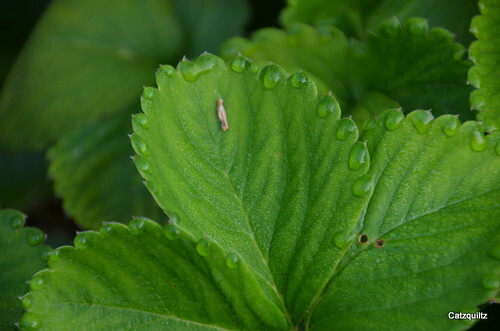 The strawberries are doing some plotting of their own. However, I have a plan for them (muuwaahaahaa). More on that later. 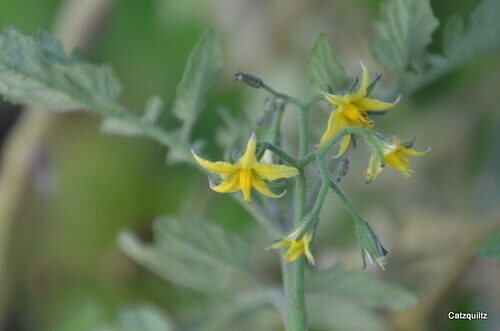 This is the tomato that wouldn’t die. I thought it was done, after an amazing harvest of candy sweet yellow cherry tomatoes, but left it in until I was ready to work outside again. When it put out new leaves and blooms, I thought I’d give it some more time. I chopped off any branches that didn’t have new growth and did a crazy weaving project with the sprawlly branches. We’ll see how it does. All my tomatoes made a come back with the cooler weather, trying to make me feel guilty about pulling them out to make room for other veggies. Next spring, the veggie beds will double in size so i don’t have to make those hard choices again. Finally, I had a nice surprise in the herb garden this morning. 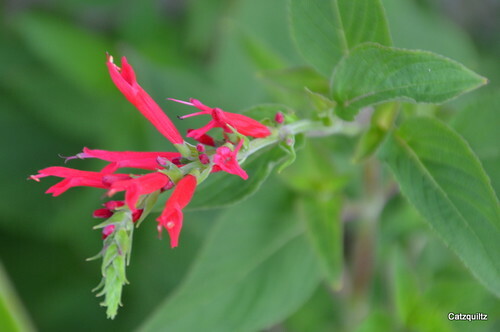 The Pineapple Sage, a wedding gift from Cindy & Donny, is blooming! I wonder if that popped up over night or if I’ve been ignoring my herbs and just didn’t notice. I think the basil needs my attention next. More photos over on my Flickr page.